When we were setting the date of the 15th Anniversary performance of my one-man play The Revelation we were all thinking it would be in March, but one conflict after the other pushed it back to next Saturday. Little did we know that the timing would make it a comfort to us all as we mourn the tragedy of the Boston Marathon bombings. On September 14, 2001, I was slated to perform a different play at a venue near New York City. I called up the host and asked if his group would be open to me switching plays. I sensed The Revelation would be the better offering that week. The Revelation's message of hope in the midst of persecution is a perfect reflection on the Lord's goodness and great love for us, no matter what we read in the headlines. I hope to see you there. Details follow. 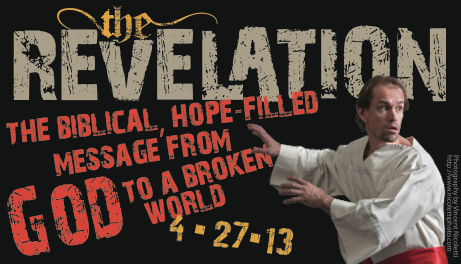 Rich Swingle will perform The Revelation on April 27 at The Crowne Plaza of White Plains, NY, 7pm. FREE Admission. The Crowne Plaza is at 66 Hale Ave., White Plains, NY 10601. It is a $5 cab ride from the White Plains Metro-North Train Station or call Crowne Plaza for their free shuttle: 914.682.0050. Rich has performed this play Off-Broadway, at national arts conferences in the US and Canada, in Sydney, Newcastle and Melbourne, Australia. He even filmed scenes from it in a cave overlooking Jerusalem. Don't miss the opportunity to see it near you. This FREE one-person play is accompanied by illustrations by Jim Warren and musical worship interludes by Samhill Road. Refreshments will be served and a love offering taken, but this uplifting event is being offered FREE because we need to remember that God loves us and the world He created. Bring friends, relatives and those who are seeking God to this exciting, encouraging event. You can see excerpts from the play and an interview with Rich and Samhill Road and also download other promotional materials at www.WestchesterChapel.org/Revelation. Salt and Light; Useful or Useless?